Immediately RIM Launch Playbook 10 Inch? ~ " World Information "
Immediately RIM Launch Playbook 10 Inch? Rumors, Research In Motion (RIM) will launch the successor to the BlackBerry Playbook with 10 inch screen. The latest rumored Playbook will attend this year. The news detikINET obtained from BGR report on Thursday (05/05/2011). 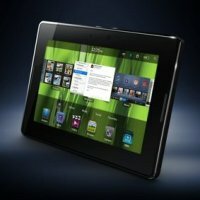 If the rumors are true, then the RIM does not linger Playbook penetrate into the market, after April of this Playbook first version is present. It seems that RIM is planning to expand their market segmentation tablet. Playbook 10 inch which would supposedly called 'Playbook 2 'is reportedly going to have updated the OS that would be predicted as the BlackBerry OS 7, with a completion email client as well as BlackBerry Messenger (BBM). In World BlackBerry 2011, RIM has yet to confirm about the rumors. But clearly, the latest series BlackBerry Bold 9900 and 9930 immediately slid around August 2011. It is possible that RIM will introduce the Playbook 10 inch is the next event, which will be held October 18, 2011 on BlackBerry DevCon event. What Reasons Great Companies Choosing a PC?